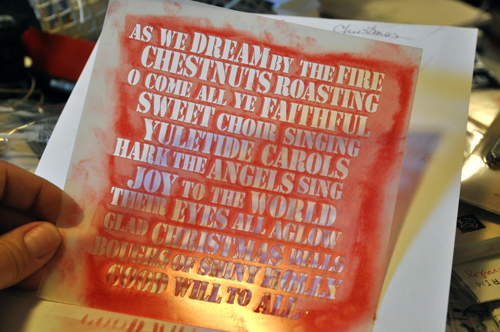 I had this 6x6 stencil from Red Lead Paperworks that had been used repeatedly a couple of weeks ago. It was covered in red pigment ink -- and still kinda wet. I didn't want to leave it like this, as the next time I used it the pigment ink would come through on my project in addition to whatever other ink or paint I was using. I grabbed my bottle of the Best Cleaner Ever and gave it a couple of spritzes. With just swiping across the surface with a paper towel, you can see how much ink is coming off. To keep cleaning, just continue wiping gently. 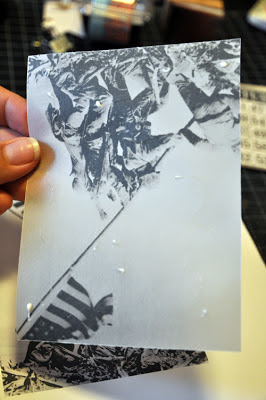 With stencils, you need to be careful not to bend or tear any of the openings. You can see how the ink is also rubbing off on the white paper underneath. 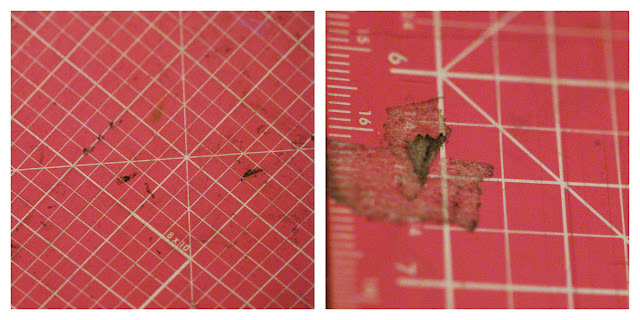 After I was done wiping off the front, I flipped the stencil over and wiped the back as well. To clean around the word cut-outs, I sprayed my paper towel with a bit more of the Best Cleaner Ever and rubbed very carefully one letter at a time. You can see the difference in the upper right-hand part of the stencil versus the bottom where there's still a red outline. 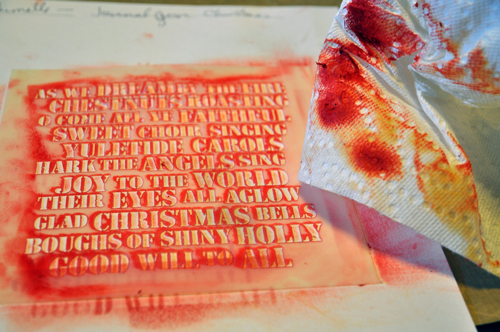 When I was finished, I lightly rinsed my stencil in water and set it aside to dry. Now it's all ready for the next time. - Cover parts of your paper stick with painters tape and cover everything with chalk ink, let it dry a little. - Cut a cardstock circle. 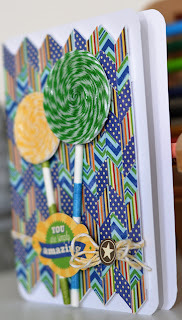 - Put a tiny drop of Best Glue Ever in the center of the punched circle. Best Glue Ever is so AMAZING you don't need more than that to hold! 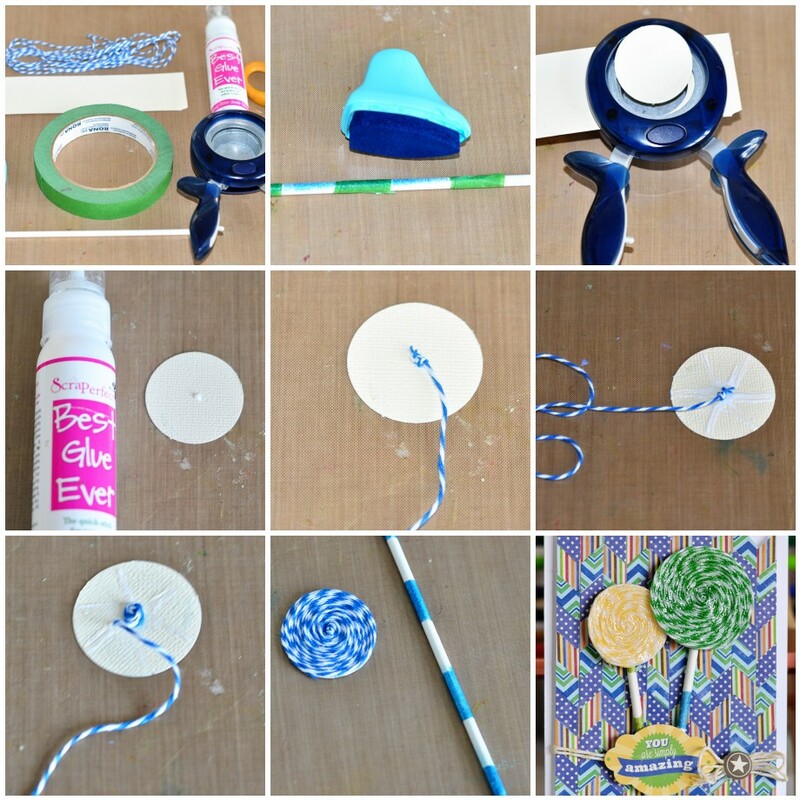 - Make a knot on one end of your twine and glue it down in the center of the circle. - Add thin glue strips all around the circle, starting from the center until the edges. Those will hold the twine down beautiully. - Press the twine around the knot following the circle shape. 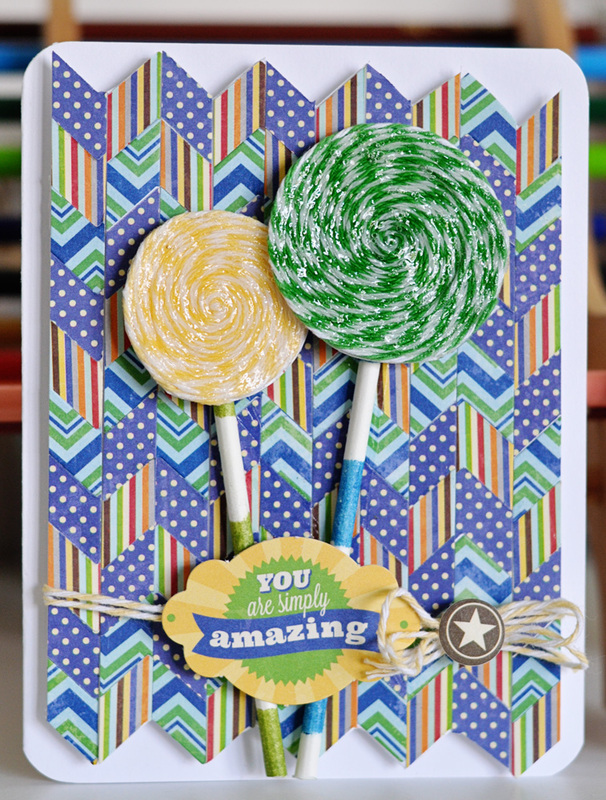 - Cut the tip of the twine once you have covered your entire cardstock. Add a final drop of glue to hold the tip down. 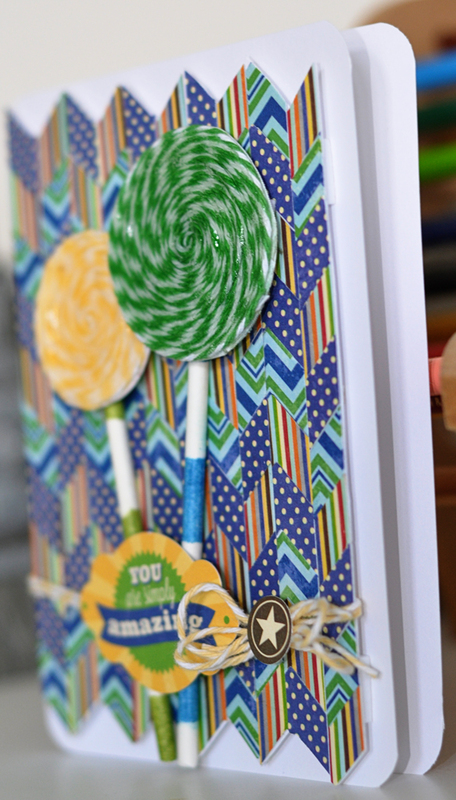 Remove the painter's tape from the stick and you can assemble your lollipop! Easy right? 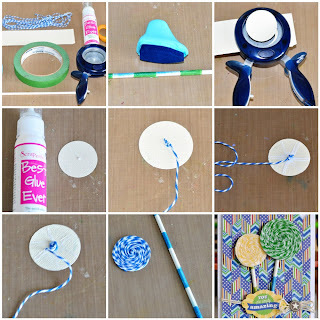 I hope you have enjoyed this tutorial, and you will see that those twine circles are highly addictive, specially when you have something like Best Glue Ever to speed up the process and make your life so much easier. I needed more cards for Jayn's friends. Somehow or other, it's always easier to make a feminine pretty card, than for guys. One of the things I like to do, especially when I have a big job ahead, is to lay out all my tools. I put my Best Glue Ever, my Embellie Gellie, my Perfect Crafting Pouch and my Perfect Cleaning Cloth right there to either side of my cutting mat. I usually set my Best Cleaner Ever bottle out also. 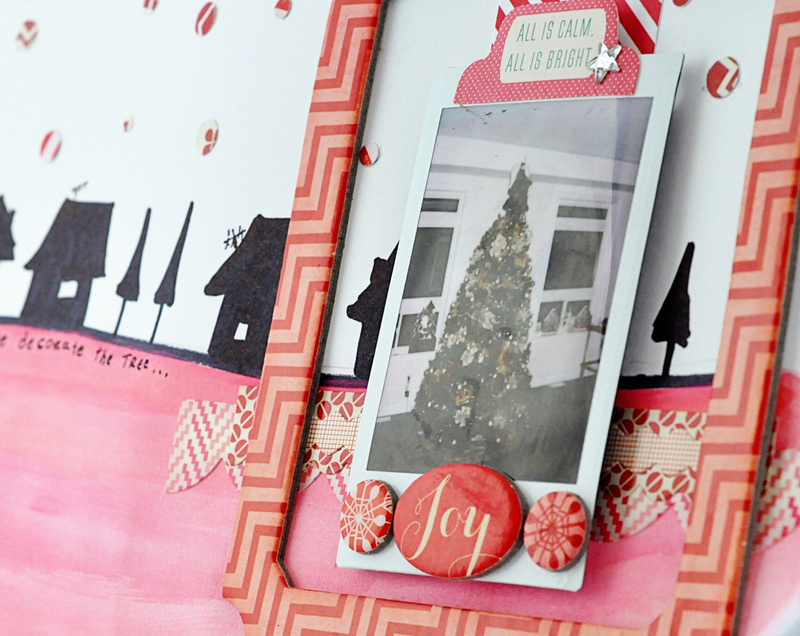 Then I gathered just a few coordinating cardstocks, my stamps, and my embellishments. Ever since I did my big household clean up and have my craft materials spectacularly organized in labelled, small, clear boxes, getting everything out AND putting everything away is so much easier. Smaller boxes ensure that everything stays very categorized. I feel much more productive. I'm an edge-inker. I like to do it with multiple colors sometimes, and the Perfect Crafting Pouch helps so much with drying those pigment inks faster. 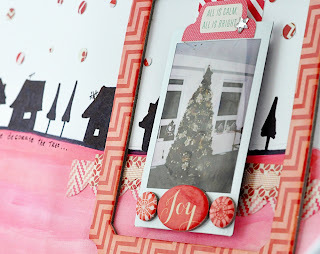 For some of the cards I used some rub on sentiments to compliment the stamping. You can see here the multiple colors of edge inking - green and brown. I used craft foam and Eco-board to raise elements, and added small brads, laser cut chipboard shapes and Dew Drops (Robin's Nest) embellishments. You only need a tiny drop of Best Glue Ever, which is easy with the narrow spout on the bottle. I used both wood plaques (swiped with Perfect Crafting Pouch) and Eco-Board pieces for stamping my Thank You message. Best Glue Ever handles every different kind of material, including wood, metal and plastic buttons, even when they are bumpy and uneven. I have a set of miniature playing cards that I'e been using for paper craft. They are quite shiny, so I swipe them with the PCP to help my ink adhere to the edges. This particular card is actually intended as a birthday card. The sentiment is a rub-on. For a couple, so not too girly, I hope. It's time to send out those thank you cards for my daughter's birthday gifts. She asked me to make them, and she would sign the insides. Plus I had a couple of thank you's for other folks too. So I had a mixed bag of recipients, ages, genders, family, and business associates to send cards to. Phew. First for family members' birthday thanks. Now that my daughter is 13 and almost grown up, I thought it would be cute to use some duplicate pictures I have of Jayn when she was little. 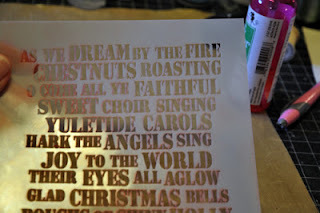 I've already scrapped them, so I didn't mind cutting these up. I have some tiny button brads, which look sweet on Jayn's little jumper. As usual, Best Glue Ever handled all the different materials - slick photo paper, card, wood, craft foam (for 3D effects) and plastic embellishments & buttons - perfectly well. I used the Perfect Crafting Pouch to dry my inks and to pre-treat the little wood pieces (repurposed element) prior to stamping to minimize bleed. 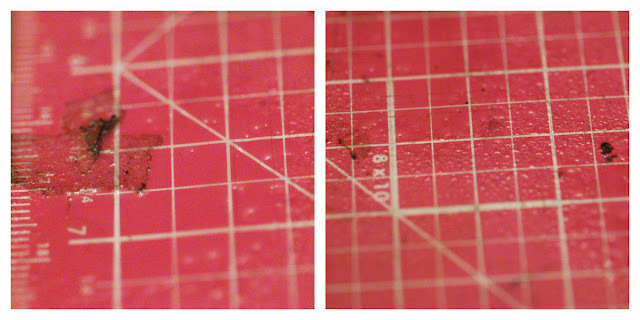 I used the Perfect Cleaning Cloth to dust off excess, and clean finger prints from my photo elements. And of course I used the Embellie Gellie to place small embellishments, and help with positioning the different elements. I think these are very special and personal. 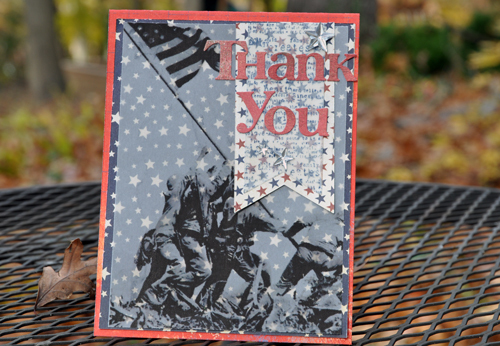 Today we have a card to thank all the veterans for their service. 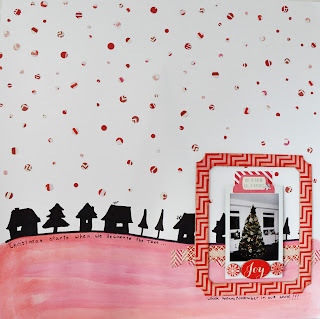 To make this, I used patterned paper and vellum along with the Perfect Crafting Pouch. Before running vellum through your printer, treat the vellum with the pouch. 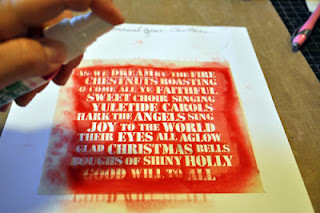 You'll avoid smearing your image as well as dry the ink faster. 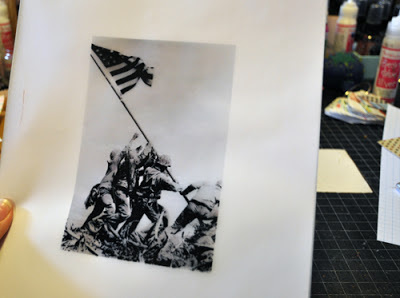 Once the vellum is dry, trim your image to size. To adhere the vellum, use the Best Glue Ever. You don't need a lot. I place the glue on the back (this is about it!) and use my finger to spread the glue to coat the back -- invisible coverage! And I used scraps from the edges of my vellum to stamp with Jenni Bowlin dye ink. 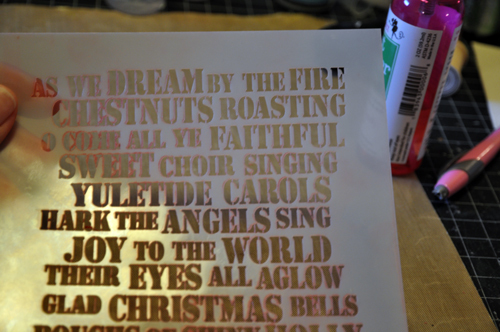 I retreated the paper before stamping, then lightly pounced the inked image to speed drying time. 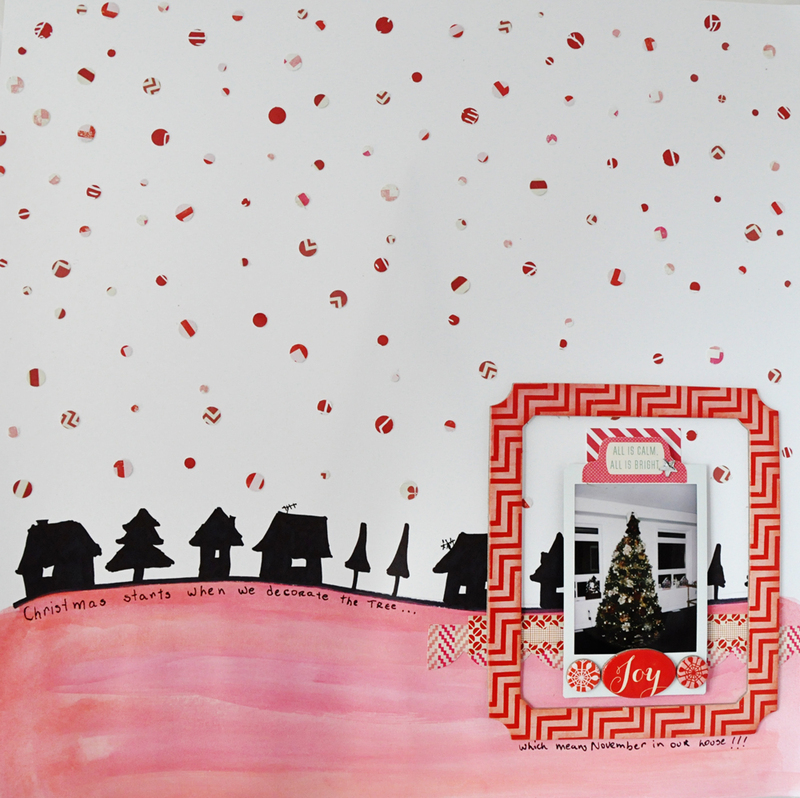 A few scraps, a new Dienamics banner die and the Best Glue Ever and I was ready to add my sentiment. I've just posted on my Iggy Jingles blog, the story of my daughter Jayn's Halloween costume. I made a mistake with my method, and ended up with dimensional fabric paint residue well and truly stuck on the tunic. Of course it was center front too! But Best Cleaner Ever came my rescue. I was able to soften and clean off all the bad paint and get a nice clean fabric surface to stencil. There was no damage to the underlying polyester fabric, nor any staining. Jayn was so happy with her costume in the end.